I know it's not quite Fall, but I've been hankering for Pumpkin! Those Pumpkin Spice desserts, latte's, and treats are not far away, so I thought I'd go ahead and make some Pumpkin Spice Soap right now, because I'll be using it well into the Autumn months. 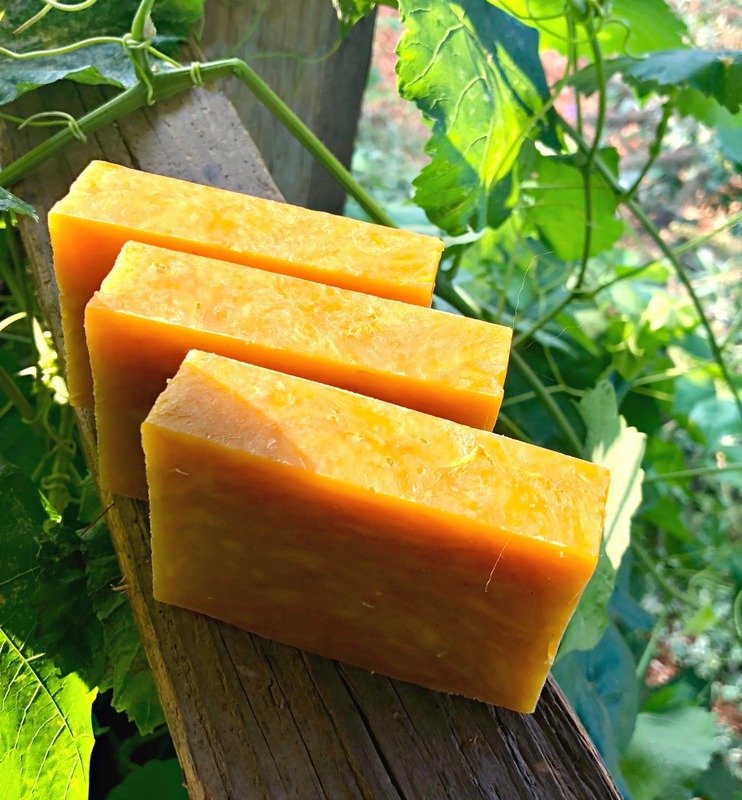 I adapted my no-fail hot process soap recipe by adding pumpkin and scenting it with the most scrumptious essential oils. Want natural, handmade soap using the hot process method, and scented with essential oils? Here you go! Before I get into the recipe, I just wanted to let you know I have a printable hot process soap making checklist and basic directions for you! It’s free! All you need to do is complete the form at the bottom of this article. NOTE ABOUT ESSENTIAL OILS FRAGRANCE: Essential oils are all natural, and because of this, they are more pricey than chemical-based fragrance oils (which are toxic). The links above are to Amazon, and I tried to find decent brands at a reasonable price, keeping in mind you are using these essential oils for scent and not therapy. If you get serious about your soap-making endeavors, and want to buy quality essential oils at a great price and in bulk, I suggest Starwest Botanicals. They are not the least expensive on the market, but the quality is absolutely excellent for making soap. NOTE: You can get my free Hot Process Soap Making Checklist by completing the form at the end of this article. It will help keep your soap making on track! Learn to make your own customized hot process soap using herbs, spices, clays, and natural ingredients with my eBook. Make soap with confidence! The tools needed for making hot process soap are a bit different than for cold process soap making. But once you have them, you'll be ready to make your soap always! NOTE: Always use wood or stainless steel or glass for your hot process soap making. Also, regarding the soap mold: The link here is to the mold I use for this recipe. This is a three pound soap recipe, so you will have a "bread top" on your loaf, which you can cut off or use to make soap balls. Or--you can leave it for a nice rustic look! Alternatively, just find a larger mold if you can OR split your soap between two smaller molds. You just follow basic hot process soap making directions. That link will give you an excellent picture tutorial to follow. I'll lay out basic instructions here, but if you are new to soap making or to using the hot process method, please take a look at that article and/or this one: Rosemary-Lavender Vanilla Hot Process Soap. Step 1) Measure out your oils into a crock pot set on LOW. Step 2) Measure out your lye solution. Add the water and pumpkin first, then pour your lye into the liquid---NEVER the other way around. Step 3) Pour your lye solution into the oil mixture in the crock pot. Step 4) Using your hand blender, stir until the mixture reaches trace, like a thick pudding. Step 5) Let cook! Stir occasionally with your wooden spoons as you notice the soap "crawling" up the sides. Remember to wear your gloves and glasses, as the soap is caustic at this point. Step 6) Keep stirring down as needed (usually just 2 or 3 times) and cooking until the soap reaches a gel stage, translucent and waxy. You can do the "ZAP" test if you like. Refer to the articles above for a full tutorial on how to know when your soap is done. Step 7) Press your soap firmly into your soap mold. Still got those gloves on, right? It's HOT! You'll want to be sure you get that soap into all the corners and press well to get rid of any air pockets. Step 8) Let cool completely. Step 9) ***If you want soap balls, cut your top off after about an hour or so, and form them. Leave them to finish cooling. Step 10) Leave the soap in the mold several hours until it's hardened. Remove from the mold. You can leave it as a loaf if you want, and cut it as you need it, or you can cut it all now. It's ready to use and enjoy! NOTE: Some soap makers believe you need to wait another one to three weeks to let your bars cure more and harden up more. Honestly, with this particular recipe, a few extra days won't hurt, but I consistently use it right away. It will get harder with time, but this is such a great recipe it makes little difference in my book. With softer recipes, this may make a difference, but this one is great for immediate use. Learn to make handmade all natural hot process soap with confidence. Afraid to try making soap? Hot Process Soap Making will get you over your fears and set you on a beautiful soap-making path! I love, Love, LOVE this soap! The pumpkin seems to add an extra softening ability to it for your skin. It lathers and conditions very well, and has a good cleansing score too. You can run the recipe through Soapcalc.net if you want more information on its performance. Just substitute the pumpkin for more water (15 ounces total water) in the soap calculator. This is a lovely orange soap and smells A-Mazing! It's great for scenting up your home or bathroom, and it's wonderful just to go ahead and use and enjoy too. Personally, I think this is a great soap to make for giving as gifts. And did you know cinnamon is believed to be an aphrodisiac for men? Hmmm? I'll be making more of this soap for sure this Fall! Let me know if you try it, and how yours turns out! Or, if you have questions--- Remember, read through the articles referenced above if you are a new hot process soap maker or just a new soap maker in general. If you like this recipe, you'll also love this recipe for Fall Spice Soap with a hint of Mandarin Orange. Yummy! Hot Process vs. Cold Process: Which is Better? Have fun with your soap making! P.S. Sign up for the weekly newsletter and get access to the Healing Harvest Homestead free Resource Library! And there you’ll find my Hot Process Soap Making Checklist + Basic Instructions, which is a life saver if you are making hot process (or even cold process) soap! There are also all kinds of other goodies over there, and I update it weekly!